Global oil prices are turbulent. They are pushed and pulled by the forces of demand and supply which continue to shift in different ways. 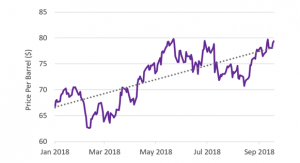 At the time of writing global Brent crude oil prices have experienced their third consecutive day of rising prices (up 1.73% during this time). 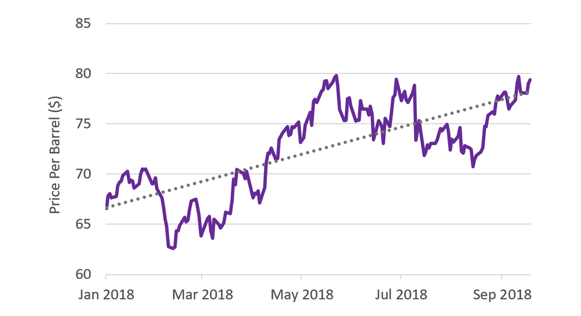 In fact, oil prices have been in an upward trend throughout most of this year. 1. US production of shale oil; brought on new supply estimated at c11+m barrels per day (b/d) and forecast to go higher. The International Energy Administration (IEA) estimates that the US will become the largest oil producer by 2023. 2. OPEC cuts to production; in cooperation with Russia and other non-OPEC producers (a group referred to as OPEC +) production cuts occurred at a time when prices were falling. Restricting supply has been generally successful in pushing up prices. 3. The value of the dollar; all trade in oil is conducted in US dollars helping non-US oil producers increase revenue if the dollar is strong. However, recent reports suggest the EU, and some other nations, are looking at establishing contracts in prices other than dollars. This is being considered because of the threat of sanctions imposed by the US on countries trading with Iran. 4. Global demand for oil; in this regard demand from China is particularly influential. Meanwhile, Global GDP is firming thanks to US led economic growth inspired by Trump’s tax cuts. In recent months a new factor has emerged to add to our list. This relates to President Trump’s announcement that in November 2018 he would reinstate US sanctions on Iran unless President Obama’s initiative is renegotiated. The original Obama deal he refers to was negotiated back in 2015 and was designed to curb Tehran’s nuclear activity. This was known as the Joint Comprehensive Plan of Action (JCPOA) – but referred to by Trump as ‘defective’. Because of US policy interventions, Iranian production (world’s sixth largest producer) revived under the Obama plan is now faltering under Trump. This coming Sunday (23rd) OPEC+ will meet in Algeria to discuss how to reallocate oil supplies to make up for Iran’s lost supply. In a recent tweet President Trump expressed his desire to reduce oil price pressures, urging OPEC nations to increase supply. Trump’s intervention is timely. At an OPEC meeting in June talks were held to consider increasing production. It is also reported that Russia (second largest global crude oil producer), who have historically been difficult to negotiate with, are keen to open the taps. This makes sense for them because they are maximising beyond previous production highs i.e. Soviet Union (1991) at 11.36m b/d and 11.25m b/d in October 2016. Evidently, there is still more in the tap! So, Trump’s tweet to get prices down comes after initiatives which are already underway to increase supply. If prices go lower do not be surprised if you see another Trump tweet. It may look like this- ‘My instruction to get oil prices down worked! This is to the benefit of the world and US citizens’. When OPEC met on Sunday, Brent crude climbed above eighty dollars a barrel after OPEC and its allies signaled less urgency to boost output despite U.S. pressure to temper prices. It was reported yesterday that the level of inflation in the UK unexpectedly rose to 2.7%. This was higher than the consensus estimates of 2.4%. The outcome, portrayed in some media outlets as a ‘nasty surprise’, is well within the forecast margin for error: short term price fluctuations are tricky to predict with precision. The Office for National Statistics (ONS), which gathers and reports the data, points out that some of the upward price shifts are likely to subside in the coming months. The components of inflation showing the greatest price strength are transport and recreational goods and services, thus partly seasonal and possibly temporary. Moreover, the future path of inflation is expected to remain benign, with the Bank of England’s (BoE) forecast showing inflation falling to 2% by 2020. Despite this, some pundits believe the BoE inflation forecast is now looking vulnerable. They are the same voices saying the BoE’s approach to interest rate policy is wrong, meaning they think interest rates will have to head higher than currently predicted. The response by those calling for higher interest rates, on the back of the latest inflation release, seem reactive. There are many factors weighing on the inflation series, not least fluctuations in the exchange rate and levels of economic activity. Economists point out that a relatively weak pound pushes up import costs, and pushes up the price of fuel, which is priced in dollars. The currency translation effect on imported goods and oil is undoubtedly unhelpful but will be mitigated or even reversed if sterling arrests its recent decline and starts to climb back up again. Rates of growth in the economy also play a part, embedding inflation and sometimes pushing it higher. This tends to happen when economic growth is significantly above trend, whereas constrained investment in some areas of the economy, due to Brexit worries, is thought to be holding back growth. In terms of interest rate expectations, forecasts suggest the current rate of 0.75% is to remain in the short-term with an initial increase to 1.00% by the third quarter of next year heading towards 1.50% in 2020, according to trend data from the BoE. Interest rates, at these levels, are expected to lag growth, provided it remains below trend (generally estimated at 2.5%). If so, this means policy will be loose allowing interest rates to remain lower for longer. However, if economic growth picks up, creating excessive demand for goods and services, and inflation becomes prevalent, a different monetary policy response should be anticipated. Inflation effects around ‘loose’ monetary policy, micro and macro factors are largely indeterminable because they are wide ranging and subject to several influences. Therefore, central bankers are often seen to be reacting to inflation as it arises rather than proactively batting it back before it shows up. Since the credit crisis central bankers have been intent on making sure general price levels do not fall. To do this, they have chosen policies to stimulate growth hoping that prices neither fall, nor spiral out of control. The impact of rising prices with low interest rates is, however, particularly harmful for cash savers. Inflation erodes the real value of money; referred to as the purchasing power of money. In simple terms, with inflation your money won’t buy as much today as it would yesterday. Yesterday we learned that the UK’s proposal, the so called ‘Chequers plan’, has been rejected by EU leaders. In a riposte, Theresa May has shown resolve, stating that ‘no deal’ is preferable to rejecting the will of the UK electorate. The political impasse could be a precursor to a compromise yet to be revealed, or it may signify a deadlock. Meanwhile, the Pound has fallen (1.47% vs US Dollar and 1.20% vs the Euro) which has boosted returns from non UK investments and from the FTSE 100 (up 122.91 points or 1.67%). The FTSE 100 is dominated by businesses that earn 80% of profits overseas.